With its unique blend of fine aggregate and premium white cement, Glass Tile Premium Thin-Set Mortar offers the ultimate in bond strength for the most demanding installation requirements for larger format glass tile, glass tile mosaics and other difficult to bond tile and stone. 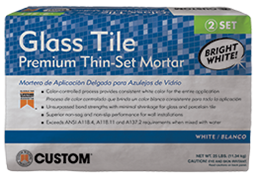 Glass Tile Premium Thin-Set Mortar is formulated to provide a consistent bright white back drop for clear, iridescent and translucent glass tile to accentuate its brilliance and beauty. The non-sag properties support vertical installations so tile won’t slip and contains excellent handling characteristics. Exceeds ANSI A118.4, A118.11 and A118.15 without the need for additives. A three-component, water-washable 100% solids epoxy mortar system for installations where exceptional high-strength and chemical and impact resistance is required. 100% solids epoxy systems unique formula produces a mortar with greater bond and compressive strengths and improved chemical resistance over conventional cement or emulsion-based setting systems. EBM-Lite's™ unique and technologically advanced formulation provides non-sag and non-slip features that allows the mortar to hold its comb and hold tile in place. The non-slump capabilities are especially useful for supporting larger format tile or stone in floor installations. Formulated with CustomLite® Technology, it's 30% lighter than other epoxy mortars. This technology allows the handling characteristics of a cement-based mortar but retains the superior performance of an epoxy. It is the first 100% solids epoxy mortar with recycled materials contributing to LEED®. Exceeds ANSI A118.3 standards. An economical, polymer-modified mortar for use with large format tile and natural stone. With a non-slumping formula to eliminate lippage, Medium Bed Mortar can be applied to 3/4" (19 mm) thick on horizontal applications. Use it for vitreous, semi-vitreous and absorptive tile, including ceramic, quarry, pavers, cement and porcelain, gauged or ungauged natural stone and pre-cast terrazzo. 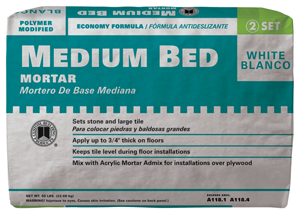 Marble Master is a medium bed, dry set mortar designed for installing marble, granite and tiles 12" x 12" (30 x 30 cm) or larger. Non-slumping, eliminates lippage, non-sag/non-slip on vertical installations. Meets ANSI A118.4 and ANSI A108.11. Fast-Set 5000 is a sanded thin-set specifically designed for time-critical installations. Grout in just 2 hours, traffic in 6. Polymer-modified for high bond strength. Excellent for commercial use by experienced installers or cold temperature installations. Meets ANSI A118.4. Designed to provide superior bonding of porcelain tile to concrete surfaces, backerboards and self-leveling underlayment. Polymer-modified Porcelain Tile Fortified Thin-Set Mortar also excels for large modular tiles and radiant heating system installations. Use it for interior or exterior floors, walls or countertops.